I thought I had read somewhere that CSS should not be used for kindle formatting (I may have misread this). Looking at some of the samples you have on Kindle, I really like the formatting of your books. The formatting is nice, clean, professional, plus easily read. This is definitely the style I want to use when I start publishing my own work. My question is, does using the CSS formatting require any additional programming for when a user decides to increase the size of the text? As I wouldn’t want it to be broken because I set the text size and unknowingly prevented them from being able to resize. Thanks for any info you can provide to the above. The Kindle can handle CSS just fine, In fact, if you really want to make sure your books display consistently without problem on any platform, I found CSS the best and safest way to go. Once you have your style sheet n place for your book it requires absolutely no additional programming, particularly if you use the relative em sizing, when readers change the font size on their device. The text will nicely reflow and adjust to the new setting. Thanks for the info! I’m interested in reading more of your post. Good and solid practices! These will serve us well as the technology evolves and new platforms and formats appear. Thanks for all the great formatting instruction. Just wanted to let you know it is much appreciated. I’ll buy the first Jason Dark novel today. I have greatly enjoyed and benefited from your series. All of the books I convert are of a theological nature and consequently there are a lot of quotes from the Bible. When I have had these books printed I set up a ‘format’ for the Scripture quotes giving them an equal right / left indent with justification. The following CSS style works great in a browser viewed html but in the Kindle it gives no right indent. Is the Kindle capable of giving a right indent? Also, it doesn’t seem that on normal (full width) text it is necessary to justify as the Kindle seems to do it automatically. Sorry mate, it looks like a worthy effort but by part 5. I was utterly lost and confused. I can write and I can do enough basic html to pretty up an ebay listing but this simply does not make any sense to me. I think the point at which I got lost was the ‘make sure you use the ‘alt=’ command … er, why. What is it? I’ve got the wrong kind of brane perhaps. Why can’t I format it it in Word using ‘real world’ commands and then just convert to htm before uploading? I know how to format a document, insert bookmarks and links and do a decent title page layout. I have to assume that Word is going to do a reasonable job, don’t I? Even if it isn’t perfect, I think I could knock out a couple of novels in the time it would take me to get competent at writing code! I said my piece about Word and eBook exports. Nothing to add there. The eBooks generated through word processors are prone to cause problems and errors across various platforms and end up being plain ugly to begin with. I prefer an eBook that is properly formatted. If you can’t do the eBook conversion yourself, then hire someone to do it for you, but please, don’t be another one of those amateurs who put out their eBooks without any regard for quality. You are not only hurting yourself, you are hurting all of us! As for the alt parameter, it is simply a short text description of what the image shows. I noticed that I am a bit cursory there, though, you are correct, and I may edit the passage to include some additional information. I am considering writing a series of eBooks for Amazon’s new eBook publishing service. If I write it in Word, won’t they do the conversion for me? Yes, I know that they will also have to do html graphics code as well as code to embed videos which I may use, but isn’t that what they do for their authors? I’d appreciate your response. Thanks. I know you have provided a fine article on eBooks here, but I, too, just can’t get into coding. It’s not what I can do. Sorry, but no, that is not what Amazon is providing. Their conversion capabilities are extremely limited. I commend you on your most excellent eBook formatting series. It really helped me get my first short story formatted for the Kindle. Thank you so much for providing this. I hate to be an HTML nerd, but the needs to have quotes around “text/css” or else it will fail validation. I hate to be an HTML nerd, but the <style=text/css> needs to have quotes around “text/css” or else it will fail validation. Thanks again for great series. You are correct. I always have quotes, but because I was writing much of this in a word processor, which would have converted them into unwanted curly quotes, I wrote the code without quotes at all and probably forgot to re-insert them later. Thanks for pointing it out. You’re welcome and sorry to be the turd in the punch bowl. Again, a great series on eBook formatting! I already got side tracked in your discussion to a link to a more indepth discussion of CSS style sheet to “clear underlying problematic defaults in various formats”. I can understand the use of the style sheet but considering the different arguements is going way too far for me. I’ve gone on here, thanks for considering my concerns. There is a difference between HTML used for web development and that for eBooks. HTML used to eBooks is essentially just a very small subset of the entire HTML standard. Problems that crop up in web develop oftentimes do not apply to eBook development. It is a different world and a very different approach. I can’t really answer your question, because everybody has a different threshold, but in my opinion it is always worth understanding the underlying technology of what you are doing, if only to understand its limitations. You can hire someone like me to do your formatting for you, sure, but if you have read my tutorial and, as a result, are already aware of certain technical limitations of current eBooks, it will be much easier for us to communicate and work on the bets possible result. So, even if you decide not to do the coding yourself, it still gives you more control over what happens to your book in the end. As for the “underlying problematic defaults in various formats” I would not pay too much attention to stuff like that. Most of it is blown out of proportion by a handful of hardliners. The fact of the matter is that all eBook formats are perfectly capable of doing what we need them to do for 95% of all mainstream eBooks. Just a note – the reset messes up ordered and unordered lists. Took me some time to figure out why my lists weren’t displaying properly! It can’t mess anything up, it simply resets all the margins. If you create a list, naturally you will then have to define the margins the way you want them to be. Try it. Bullets and numbers show in HTML but not when rendered as an ePub file unless I define list classes in the css style sheet or remove the ul and ol from the reset. After reset, I added the following code to the style sheet to render lists properly. Your example above didn’t include any styling for lists, so I had to add it. Thanks for the detailed series! It was very helpful in understanding ebook structure. I, too, am completely lost. I still don’t know how to change a Word document into a HTML document. I looked in the Word software and bashed my developer-licensed husband’s brain against this, and we couldn’t find it. I don’t think not knowing how to do this on an intuitive basis equates to lack of concern for quality. Can you suggest a primer on how (step by baby step) to convert a Word document to a HTML formatted document? Well, you are reading that primer right there… Just start with part I of the series and make your way through it. Do you know if the ebooks formatted in this way using html, are compatible with the Smashwords style requirements and can pass through the Meatgrinder conversion ? Has anyone published through Smashwords using this method? Will the html need modifying if you are using different MS Word upgrades such as Word 2007 and Word 2010 on a PC not Mac? Smashwords does not accept HTML files. They require you to submit a word processor file and then they will butcher it until it no longer even resembles an eBook. And then they will sell it to their customers… no, make that YOUR customers. So, tell me again, why would you want to do this? I would love to see this series of posts available as a download. It would make it easier to search to reread something and purchasing a copy would be a great way to say thank you for the info. I am formting a cookbook for my wife and as a result have a lot of lists and images. I tried formatting a sample recipe that has one unordered list with no bullets and another list with a color background. They worked fine in the ePub format, but when I converted to mobi I lost the background color and the unordered list had bullets. For background color I tried both styles for a div and background color for the ul. Here are the styles I used. Nothing went wrong. That is just the way the Kindle is limited in its capabilities. You can get it fixed up properly but then you will have to create a KF8 file instead of a traditional MOBI file – but that will mean that you will be cutting out all those readers with older Kindle devices. 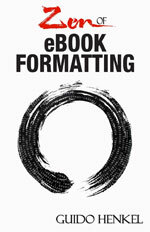 I just wanted to let everyone know, that I have just published a book called “Zen of eBook Formatting” that is now available. It covers the aspects from this tutorial in a lot more detail and also adds a hole lot of additional info, details and advanced techniques to the mix. Here is a link with a bit more info, including a look at the Table of Contents of the book. Has anyone found an answer to James Reynolds’s question above about right indent? I have a manuscript that includes some passages that I would like to be indented on both the left and right and justified. And some other text that I want to resemble a newspaper article. I just wanted to let you know that a revised, second edition of my book “Zen of eBook Formatting” is now available on Amazon. Unfortunately Amazon makes it a bit tricky for people who own the original to get the new one, but if you send them an email, it is my understanding that they will let you replace the version in your library with the updated one. If you haven’t purchased the book yet, make sure to do so now. The new version has been adapted to current developments and expands on various subjects to clarify and to accommodate new developments in eBook devices. Click here to grab the book on Amazon! First, great work! I bought your book and it’s helped. I’m wondering about your advice to steer clear of and its ilk, and to create customized p.h1 etc styles. Here’s my concern. I’ve heard and its ilk are fantastic tools for SEO and that SE spiders are designed to crawl towards these tags specifically when looking for keywords. What are your thoughts? If you eliminate them, wouldn’t that make it harder for people to find your ebook using browser searches or any other search function that uses the browser’s search algorithms? How about cramming all the SEO keywords into the tag instead? Would that be as effective? Or less effective? Since you’re not crafting a website or web pages, I am not sure how relevant SEO or browser searches are. Don’t forget you are creating eBooks, and they are in a completely different field of itself. The discoverability of the book is determined by your landing page, your Amazon product page, etc. but not by the content of the actual eBook itself. I doubt search engines and robots even know how to parse and eBook, especially not one that is potentially DRM encrypted. First, great work! I bought your book and it’s helped me as I learn how to prepare, format, and convert ebooks. I’m wondering about your advice to steer clear of <h1> etc. tags, and to create customized styles like p.h1 instead. Here’s my concern. I’ve heard <h1> and its ilk are fantastic tools for SEO and that SE spiders are designed to crawl towards these tags specifically when looking for keywords. What are your thoughts? If you eliminate them, wouldn’t that make it harder for people to find your ebook using browser searches or any other search function that uses the browser’s search algorithms? How about cramming all the SEO keywords into the title tag instead? Would that be as effective? Or less effective? Thanks for these informative articles. I notice on this page in the p.h1 and p.headline examples you used text-size and text-weight where they should be font-size and font-weight. You are absolutely correct. I apologize and I’ve corrected the instances, of course. Thanks for pointing it out. I’m surprised no one’s caught that before. First, thank you for this very informative series. I will be buying your book as well. You have given me the tools to give the same care to the formatting of the ebook as I did to the print version. The concern I have with styling paragraph tags instead of using headline tags is accessibility for readers using assistive technology. Assistive technology, like screen readers, use the proper structure of documents, including headlines to give a blind or visually impaired reader the same context we get from the text being bold and enlarged. I will be using resets and styling headline tags, hoping I can get that to work, for the best product for all of our readers. As you will see in the book I am actually no longer promoting the use of resets. Turns out that they caused quite a few problems in their own right as new devices came to market. These days I prefer to leave the defaults in place and then style from there. As for the assistive technologies, you are absolutely correct, but it’s no good if they are not working properly to begin with. The problem with eBooks in general is that they do not follow proper HTML standards. On paper, yes, but not in reality. The market is so fragmented with so many bad devices and even poorer implementations, that half the features usually do not work – and the Kindle family is on the forefront of these perpetrations. Using proper structure and best HTML practices is all nice and good, but it’s really academic if nearly all the devices and software readers are so borked that they completely defeat the purpose in the first place. But your mileage may vary, of course.